Mapei® Kerapoxy® CQ Epoxy Grout and Mortar with Color-Coated Quartz is an improved premium grade, two-component, 100%-solids epoxy grout and mortar. Kerapoxy® CQ is nonsagging and nonslumping and is designed for use in joints up to 3/8" (10 cm) in width. Easy to apply and is water cleanable. Kerapoxy® CQ durable color makes it an excellent choice for use on countertops, high traffic areas, and other areas needing chemical and stain resistance. Available in 40 standard Mapei® colors. For use as a grouting interior residential and commercial wall and floor applications: for most ceramic, porcelain, and quarry tiles, acid-resistant floor brick, pavers, and natural-stone tile (*Note: Marble, granite and slate are products of nature made from a vast combination of minerals and chemicals that may cause the material to behave or react in a manner beyond our control. Likewise, we do not have control over any of the materials or processes used in the manufacturing of agglomerates. Therefore, determine the suitability of all the materials before proceeding with the installation. To ensure desired results, a mockup installation is required before the actual installation.) For grout joints widths 1/16" to 3/8"
Mortar Limitations: do not install over substrates containing asbestos; do not exceed �" in epoxy mortar thickness under the tile; do not apply over particle board, presswood, oriented strand board, Masonite, chipboard, Luauan, gypsum floor patching compounds or similar dimensionally unstable substrates. Can you use Kerapoxy as a mortar? how mush coverage grout do I need for 300sf ,size of tile 4*16? I had my bathroom remodeled a year ago, using acrylic epoxy grout. What is the best way to clean the acrylic epoxy grout in the shower? Thanks! Mapei® Kerapoxy® CQ Epoxy Grout and Mortar with Color-Coated Quartz is an improved premium grade, two-component, 100%-solids epoxy grout and mortar. I have a non-functional well room under my concrete front step. A previous owner had the well redrilled sometime before city water became available. The well driller cracked the top of the front step which leads into the basement. It has always leaked every time it rained. I used Mapei epoxy mortar and grout to cover the front step with tile. It's been about two or three years with no leaks and no loose tile. Temperature extremes outdoors are from -25F to 90F. Thank you for your review. We very much appreciate the details concerning your success with the Kerapoxy product. What a great solution for this type of application! Bought Kerapoxy to use on an outside kitchen I am building on my deck but ended up using it to set a backsplash around the sink in my mudroom due to cool weather setting in and not wanting to store materials for months. Was initially hesitant to use epoxy based product due to some online reviews/feedback but found it very easy to work with for me. I haven't done any tile work since 1969 as a tile helper recently out of high school so I'm hardly experienced. I would highly recommend for anyone to use as long as you follow the recommendations and instructions supplied with the Kerapoxy. Thank you for your review. We very much appreciate the detailed explanation along with your satisfaction with the product. Hopefully your feedback will come in handy for others reading this review. product worked in a sauna shower! common grout (it has failed twice and required re-grouting. Thank you for you review and thank you for the testimonial to our Kerapoxy CQ. We are very happy the product met your expectations. If there's anything you need in the future please don't hesitate to give us a call. Used this product on a restaurant kitchen floor. Easy to mix and apply. This dried overnight but still protected with cardboard for 24 hours from moisture. Has done an excellent job holding up to harsh conditions of a restaurant. Would recommend. Thank you for your review. We are very pleased to hear our product is easy to use and is holding up to harsh conditions. Always feel free to call us with any questions if the need arises. a quality product for water and stain protection. easy to use , have used this product many times for high strength and non wash out of urinal areas. I am using this on on the exterior tiles in front of the house in NYC. Opening the bucket reveals a clear plastic bag with one of the 2 components in a jar inside, sitting in the second component which takes up the rest of the bucket. A little messy but otherwise ok. Getting the clear component out of the jar was not that easy to do, as it's not that wide. While mixing you should occasionally use a narrow spatula to get the stuff off the side of the bucket (you mix in the same bucket that it comes in). Application was easy, and you clean the grout as you apply it with 2 sponges soaking in water. You should get the white and the blue sponge. When done you just wait until it cures, protecting it from rain for a couple of days. I used plastic shower curtains from my local discount store. We have had a pretty harsh winter so far, temps going down to 6 degrees, and back up to 50 degrees in a few days time. No issues at all. And the grout does not need to be sealed. I really like this stuff. Mapei Keraepoxy is a great product! 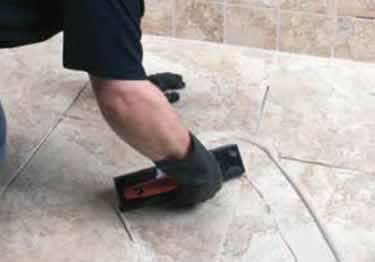 Your team extremely helpful in getting out multiple orders of the Mapei keraepoxy for a outside kitchen tile application here in Virginia. I was happy customer was happy. Thanks for all your support. Have passed your contact info on to other sub contractors.